These wholesome and nutritionally balanced smoothies are a perfect on the go meal. Hand crafted with a kitchen fresh taste, these smoothies are blended with real whole fruits and other superfood ingredients to leave you feeling full and satisfied. Blended for the best you. Remember to wear your weight belt. Drop and give me 50 crunches with this medicine ball! 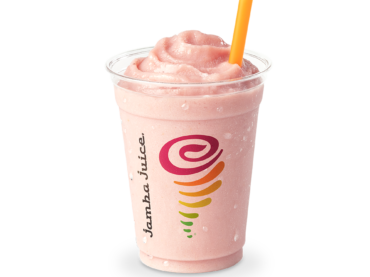 And drink this strawberry banana smoothie with either a Soy or Whey Protein Boost! Now let’s see your game face! Good work; take a lap.